← Commentary: Are The Chinese Coming? Working this year’s North American International Auto Show from the comfort of my home proved to be easier than I thought. It came down to predictability. If you did some detective work, then you’d figure out that the 2020 Toyota Supra would take center stage at Cobo Center. You also knew that Ford would finally show the Mustang Shelby GT 500, along with the 2020 Explorer introduced the week before. Eventually, the Kia Telluride would have to debut in production form after a year and change of teasing as concepts and prototypes. And, yet, it felt very truncated. Did we really miss any groundbreaking news? Will GAC become the first Chinese automaker to sell automobiles in this market, as “promised” by 2020? How will the tie-up between Ford and Volkswagen benefit each other? And, those headlines blasting through new media to get the quickest clicks and the biggest engagement. The argument that auto shows matter for debuting new vehicles still continued after Monday’s media day. As some of my colleagues will say that they will not make money by attending auto shows, auto makers are also wondering the same thing. The question of economics is looming large thanks to several developing stories worldwide regarding the state of international trade, employment, and how they will affect everyone’s wallet. Now, all eyes are focused ahead. In our case, it’s the Chicago Auto Show. By “our,” I assembled another team together. Josh Dvorak, Veronica Krawiec, and Mike Gatch return to provide content for not only V&R but for their own channels, as well. 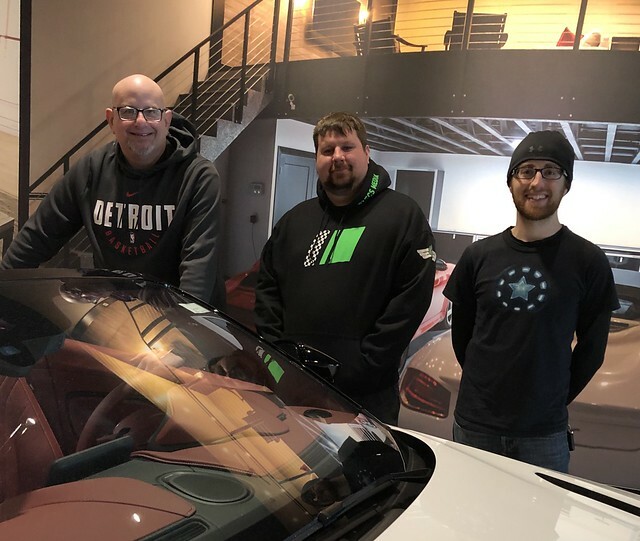 We’re adding the Minnesota Car Enthusiasts Club president Dan Balto to our team to not only assist us but to see how one of North America’s largest auto show is seen from the point of view of new media. It is also where we will present the #VOTY18 award to Lexus for the LC coupe. For this award, we have stepped up our game. Instead of a certificate inside of a frame, I am actually having the award made. My thanks to Broadway Awards in Robbinsdale, Minnesota for helping me in the process of creating something that will be more than tangible and welcoming to the staff at Lexus and Toyota Motor North America. Plus, it helps to support local business, especially as V&R is based in Robbinsdale. We Birdtown entities need to stick together to keep our community vibrant and alive. And, by the way, we are presenting #VOTY18 to Lexus on Thursday, February 7 at 10:30AM at their booth. If you’re working the show, stop by and check us out! For Josh, Veronica, Mike, and Dan, the Chicago Auto Show represents a great opportunity for them. In recent conversations, there are some inkling that they want to pursue a deeper path into automotive media. I welcome this. Their youth and enthusiasm will be their guiding principle. I am glad they are looking into going deeper into this business. It is a tough business to work in. The most successful ones thrive in the privileges and rewards you reap in it. It is the difference between standing in the middle of a media scrum and getting that exclusive interview with a key executive. The one thing I will tell people who want to be in this business is to make friends, allies, and contacts. The writing, photography, video work, and editing are part and parcel of this job. They serve as the necessary tools needed to drive content to audiences towards engagement. These four know this all too well. Granted there is no “I” in “team.” Yet, I wind up being reflective coming into another Chicago Auto Show. It was the first major show to extend a media credential to me. It was the first auto show I worked on a media day. It continues to be the one show where I can catch up on debuts I only saw online and afar. It continues to be my destination every February. Yet, it has yielded a richer sense of purpose. Chicago has always introduced me to new places to stay, to visit, to eat, and to both longtime and new people in my life. To have Mike, Josh, Veronica, and Dan along for the ride this time, it deepens the experience even further.